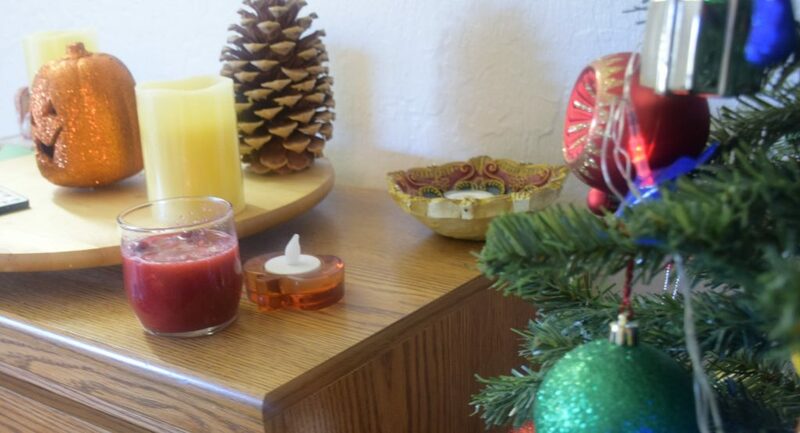 In this festive season, how about celebrating Christmas with a non-alcoholic freshly prepared juice? Since berries are in season, why not try out an easy mock-tail ? Yes pondering about these things, and then getting inspired from Vandana Singh(Vandy) I prepared this drink for a Christmas party. 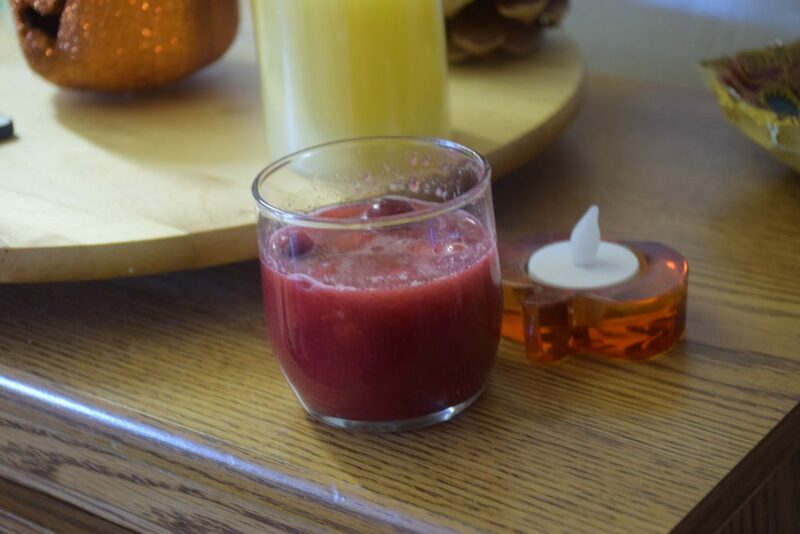 It actually needs very little time and tastes ‘berry’ sweet, tangy and refreshing. 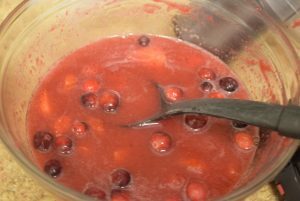 The cranberries added helps in detoxification and are naturally good for women. The strawberries impart a sweet flavor and the needed Vitamin A . 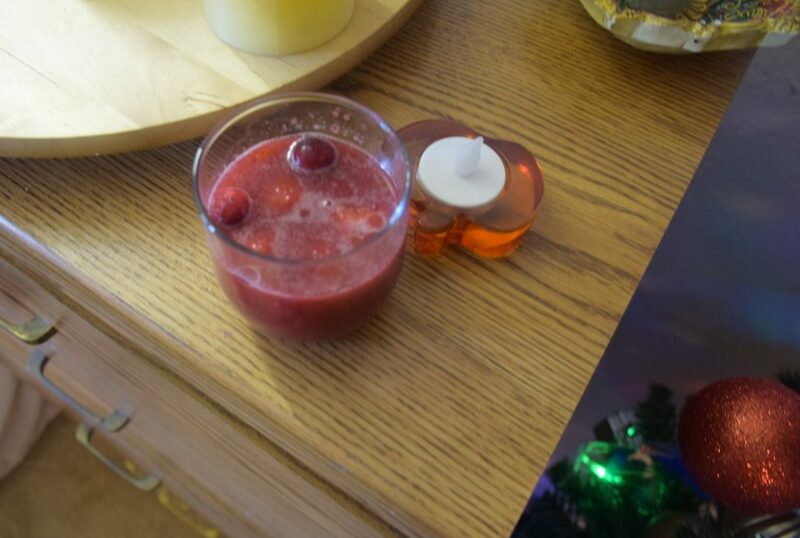 The raspberries impart their slight tartness and boosts the flavor ,color of this drink. However, you may add blueberries, blackberries too. I wanted to make it pure red ,so I chose these . So lets see this recipe now ..
1. 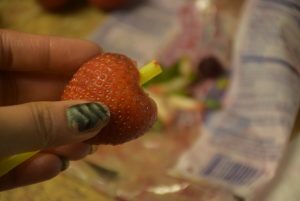 Wash all the fruits well and remove the stems of strawberries with a straw as shown below. 2. 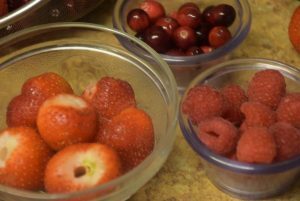 Save 6-7 strawberries , 10-12 cranberries and 5-6 raspberries for adding to the drink in the end. 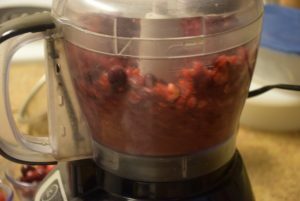 Add all the rest washed berries in a food processor or a mixer. 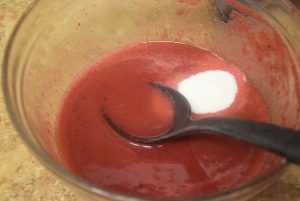 Blend them well to a thick paste like juice.If you have a juicer, just add all the berries and you will get fresh juice from it. 3. Add little water if needed while blending. Take a colander and sieve the pasty-juice through it in a big bowl. Press the sieve with a spoon to transfer as much pulp as you can in a bowl. 4. Add water as needed, and then add the sugar as per taste. Mix them well. 5. 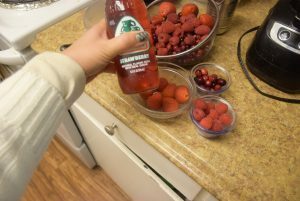 Now add the saved berries in the drink , and stir it. Let them sit in the drink for at least half hour. 6. While serving add a bottle of club soda /seltzer/ginger ale/ flavor carbonated water to the drink. Serve it immediately with some ice cubes or as it is. Wish you all a Merry Christmas !! This entry was posted in Drinks, Food, Recipes and tagged berries' mocktail, Carenshare, Christmas special, cranberrries, detoxify, festive drink, flavorful, healthy, less sugar, Merry Christmas, non-alcoholic, Prevents UTI, pure red, raspberries, shweta jindal, soda for fizz, strawberries, zindagisikhati.